Amerindians which led way to the Mayans were amongst the original inhabitants of Belize. The Maya civilization spread over Belize between 1500 BC and 300 AD and flourished until about 900 AD. European settlement began with British Jews, privateers and shipwrecked English seamen as early as 1638. The origin of the name Belize is relatively unclear, but one theory is that it derives from the Spanish pronunciation of the surname of the pirate who created the first settlement in Belize in 1638, Peter Wallace. Another possibility is that the name is from the Maya word belix, meaning "muddy water", applied to the Belize River. The early "settlement of Belize in the Bay of Honduras" grew from a few habitations located at Belize Town and St George's Caye into a de-facto colony of the United Kingdom during the late eighteenth century. In the early nineteenth century the settlement was called British Honduras, and in 1871 it became a Crown Colony. Taking advantage of Spain’s inability to establish--and apparent lack of interest in establishing--control over present-day Belize, Englishmen began to cut logwood (Haematoxylon campechianum L.), a dyewood greatly valued in Europe as the principal dyestuff for the expanding woollen industry. By the 1770s, a second tropical exotic timber, mahogany (Swietenia macrophylla King), replaced logwood as the main export from Belize. 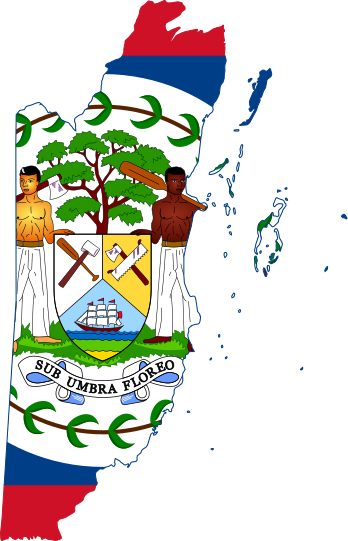 The economy of Belize remained based on the extraction of mahogany until the early 1900s when the cultivation of export crops such as citrus, sugar cane, and bananas came to dominate the economy. Hurricane Hattie inflicted significant damage upon Belize in 1961. The government decided that a coastal capital city lying below sea level was too risky. Over several years, the British colonial government designed a new capital, Belmopan, at the exact geographic centre of the country, and in 1970 began slowly moving the governing offices there. British Honduras became a self-governing colony in January 1964 and was renamed Belize on June 1 1973; it was the United Kingdom's last colony on the American mainland. George Price led the country to full independence on September 21 1981 after delays caused by territorial disputes with neighbouring Guatemala, which did not formally recognize the country. Submit and View Queries and Surnames Submit a Query or Surnames for your lost Belize ancestor. BELIZE - a mailing list for anyone with genealogical interest in BELIZE. Central America They have information on the Epitaphs in St. John's Cathedral, the Honduras Almanac for the early years of the Settlement, and some Colonial Office Records. They also have resources e.g. maps and books on how places got their names. They do have some B/D/M records as well and copies of some wills. They may not be indexed. (microfilms can be ordered from any location) Census records which state head of household, occupants, and slaves. These are from the early 1800's onward. London, England Copies of the Colonial Record Inwards and Outward Dispatches, as well as information on Coastal Trading etc. It is similar information to what the Archives in Belize hold. You can view what information they have on their website.